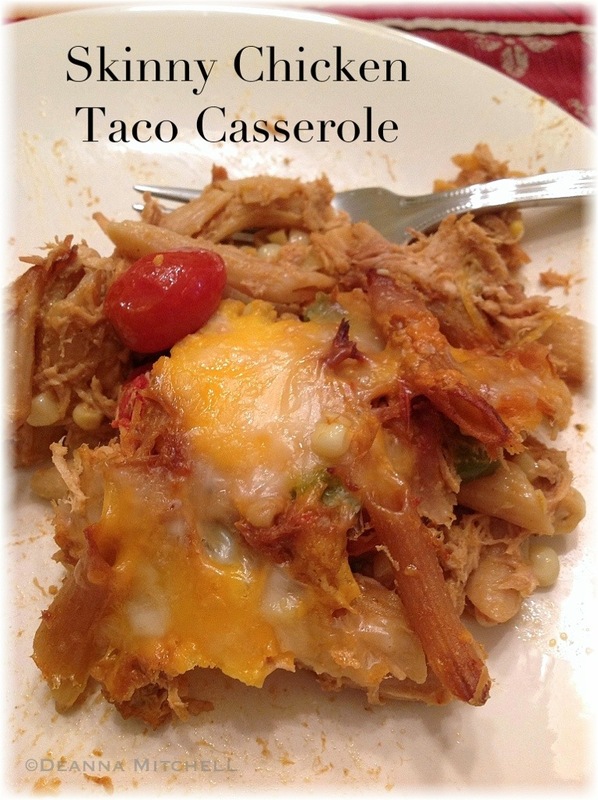 This casserole is a wonderful combination of a beefy casserole I saw on Pinterest by Skinny Mom (www.skinnymom.com) and a crock pot chicken taco filling I’ve seen so many times on Pinterest that I have no idea who to cite as the creator. I thought both looked good, so I combined them into a delicious taco pasta casserole that stretches one pack of chicken over several meals and made good use of the corn, sweet peppers, hot peppers, tomatoes, onion and garlic from our local farmers. Even the goat cheese (Hillsborough Cheese Company) and hoop cheese were locally produced! The next time, I might add some chipotle peppers in adobo sauce to make it even more spicy, but if you have little ones or sensitive taste buds, this should not be too spicy. You could certainly substitute whatever fresh vegetables you have handy! Enjoy! In the bowl of a slow cooker, add chicken breasts, salsa and one packet of taco seasoning. Cover and cook on low for 6 hours or on high for 4 hours. Use 2 forks to pull chicken apart. Alternately, you can bake the chicken, salsa and spices for one hour, covered, at 350 degrees. While chicken is cooking, sauté onion, garlic, and peppers until soft, about 10 minutes. Add the jalapeños, tomatoes corn and remaining taco seasoning and cook for an additional 10 minutes. Set aside. In a large stock pot, bring water to boil for pasta. Cook pasta according to directions and drain. Add pasta, pulled chicken and vegetable mix to the stock pot and combine well. Add goat cheese and 2 cups of hoop cheese, and stir until cheese is melted and creamy. Pour pasta mix into an 11 x 13 casserole dish. Top with remaining cup of cheese. Bake at 350 for 45 minutes or until hot and bubbly.